Caring for your new Tree or Landscape - GreenScapes Garden Center & Landscape Co.
Congratulations on your new planting! Now that your new tree or landscape has been installed, it is time to care for it. With our planting process, your plants have received all new planting soil that will ensure their success for years to come. Quality soil and exceptional plants are only one part of the process; trees and shrubs are living things that, just like you and me, need nutrients and care. Your task now is to guarantee that these plants get everything they need to thrive. Since your newly planted trees and shrubs were installed with quality soil, you shouldn’t need to do any fertilizing, at least for the first year. If you notice anything struggling, give us a call and we can help you remedy the situation. If a fertilizer is needed, we will recommend the best one for the plant, or plants that need a little bit of help. Newly planted trees and shrubs require around 1” of water every week. Periods of extreme weather (hot and dry, or cold and wet), will determine if this amount should be adjusted. Your watering procedures the first 2-4 weeks that your new plants are in the ground are the most crucial. After the first month, as soil moisture increases, the amount you water can be decreased. You do want to keep a close eye on the leaves and/or needles of your plants. Signs of stress (either not enough water, or too much), will first be seen here; watch for discoloration, dryness of leaves, falling needles, or any other drastic change in the plants appearance. Overwatering trees and shrubs can affect them as much as underwatering. Following the instructions listed here, as well as reviewing our “Planting Instructions”. This handout will give you the knowledge to properly care for your new investments. The first watering should be a deep, soaking application of the entire planting area to ensure the entire root system of all of the new plants are saturated. If your plants are watered individually, any dry soil around the plants will wick the moisture away from the trees or shrubs. Use something like an empty coffee can and make a mark 1” above the bottom; place this in the landscape bed. Run your sprinkler on the entire bed until the can has filled up with 1” of water. Do this once per week for at least the first month. If there is a lot of rain or, conversely, drought conditions, the amount of watering may need to be adjusted. Dig a small hole 6-8” deep at the base of a plant and feel for moisture. If the soil is damp, watering can be cut back. If the weather turns unseasonably warm, the frequency of watering may need to increase. Call us at the Garden Center with any questions. Just like the landscape beds, the first watering of your new tree should be a deep, soaking application. Use a hose that can reach the trunk of your tree, or several hoses hooked together if the tree is farther away. Set the hose at the base of the trunk and turn on at a slow drip / trickle. 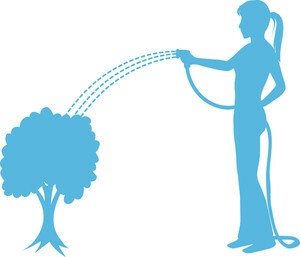 The amount of time to leave the hose will depend on the “caliper” (the trunk diameter 6” above the ground) of the tree. For the initial watering, your hose should be set at the base and let to “trickle” for 3 hours for every inch of caliper. So, for example, if you had a 2” caliper tree planted, you should let your hose run on the tree for 6 hours. It may sound like a lot of water for a long time, but the slow trickle of the water will ensure that the entire root system of the tree gets adequate moisture. Repeat this process 2-3 times per week, depending on the weather, for the first 3-4 weeks. After this initial period, the frequency of watering can be reduced as soil moisture increases. But still dig a small hole 6-8” deep at the base of a plant and feel for moisture frequently. And as always, give us a call with any watering questions.